Mid-century grandeur in the heart of L.A. 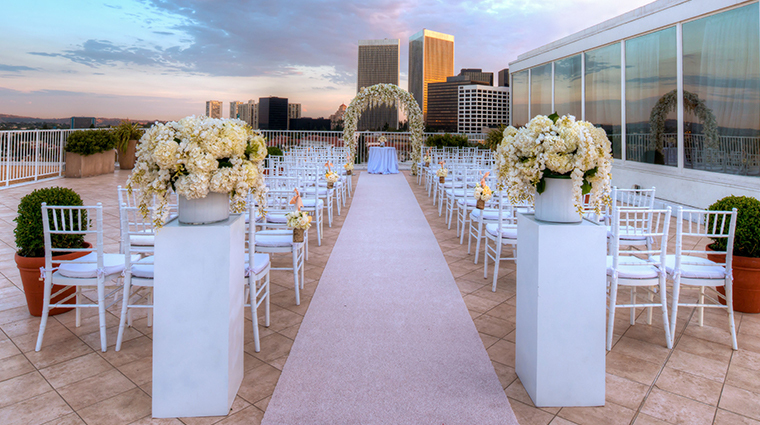 The Beverly Hilton, a Four-Star hotel with a prime location in Beverly Hills, is famous for playing host to the Golden Globes every January. But this storied hotel offers much more than a red carpet for stars to strut their stuff on. The lobby's mile-high ceiling and its 1,400-gallon salt-water aquarium may wow you, but so will the hotel's more pragmatic side: WiFi can be accessed throughout the property, even at the enormous Aqua Star pool, a favorite of sunning executives. 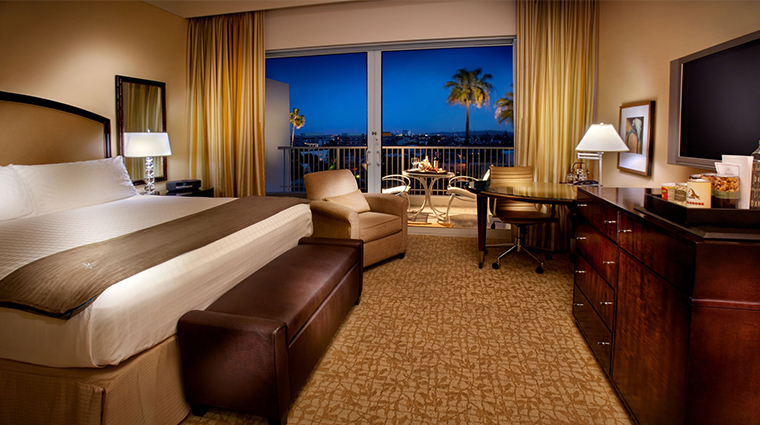 Guestrooms, decked out in soothing beige-and-brown tones, boast that nice balance between luxe and practical. For every thoughtful amenity (pillow-top mattresses, Peter Thomas Roth bath products), there's a state-of-the-art one (Bose music systems, 42-inch HDTV plasma TVs). The Beverly Hilton is celebrity central. Stars come by regularly for charity events, and to get gorgeous at the Bellezza Salon and Aqua Star Spa before hitting the red carpet. 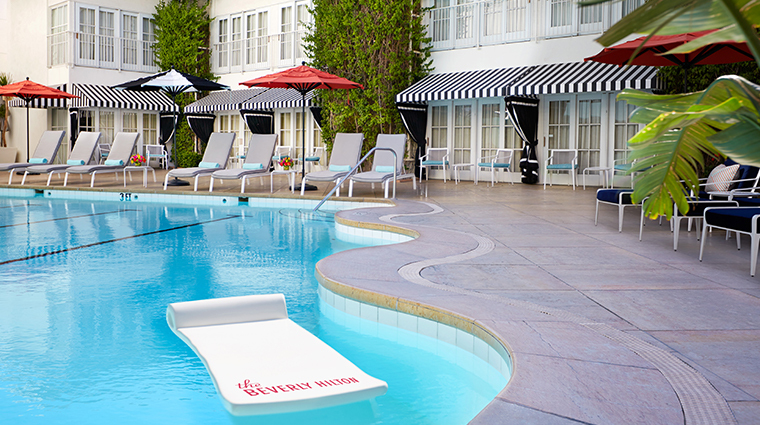 Not only can you score free Wi-Fi while you sun, but you can also take a dip in Beverly Hills’ largest heated outdoor hotel pool all year round. The swimming hole also has its own claim to fame: Angelina Jolie jumped in for a celebratory swim — gown and all — after winning a Golden Globe. Trader Vic’s outdoor lounge is a light-hearted throwback to ’50s Polynesian style. Cozy up to one of the indoor semicircular booths and marvel at the retro tiki décor, or throw back one of the potent mai tais under the stars. The property’s collection of Hollywood memorabilia cements its status as a historic hotel. Throughout the hotel you’ll see black-and-white vintage photos of celebrities such as Marilyn Monroe and Judy Garland. 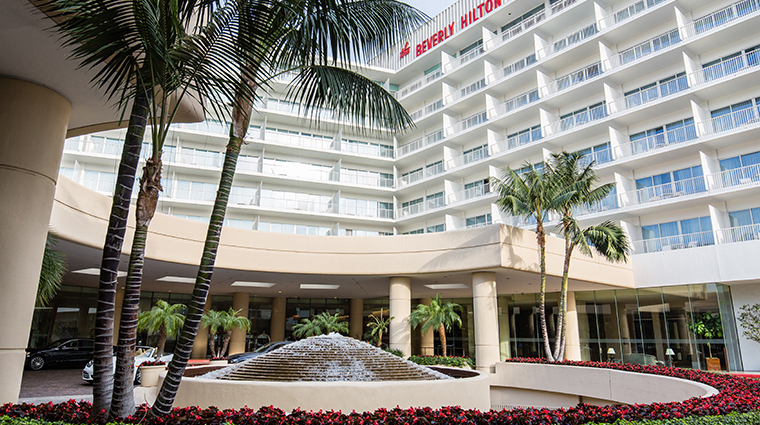 The Beverly Hilton offers two parking options: valet and self-park. The hotel charges $42 for both parking options, so you might as well let the valet fetch your car (plus, the valet always sticks a bottle of water in there for you when you’re headed out). Keep in mind, though, that if you’re doing something local, like shopping on nearby Rodeo Drive, you can avoid any hassles altogether by using the hotel’s complimentary house car, an R-Class Mercedes. 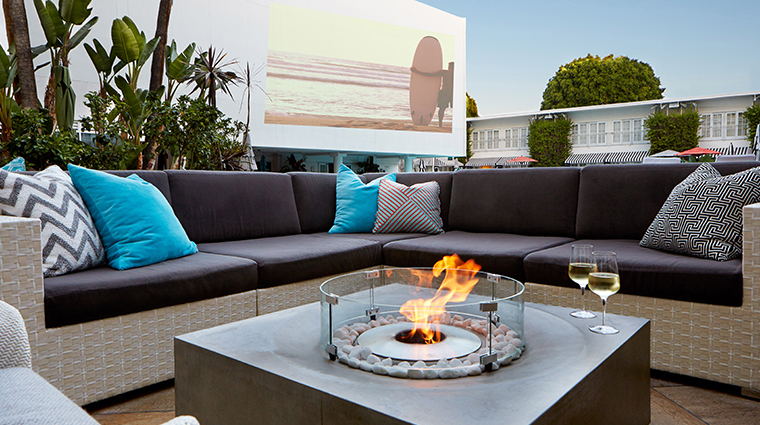 In the summer, the hotel hosts free “dive-in movies” twice a week at dusk, featuring flicks like Grease and Rebel Without a Cause that you can watch poolside. The hotel’s outpost of Trader Vic’s (which claims to have invented those signature mai tais) is the longest-standing location of the legendary lounge brand. Near the entrance to the Circa 55 restaurant, you’ll find an L-shaped glass case of goods that includes Fleetwood Mac’s Grammy Award, Frank Sinatra’s signed Anthology LP and a rare original Beatles poster that’s signed by all four of the mop-topped singers. If you are coming to The Beverly Hilton from Los Angeles International Airport, you have two options: cab it or drive it. Those who opt to take a taxi will have to pay a $38 flat fee for the 12-mile trip. Valet and self-parking cost $42, so leave your car to the valet when you pull up to the hotel. Plus, if you choose valet service, you’ll get a complimentary bottle of water in your vehicle when you take it out for some sightseeing. When you enter the warm standard room at The Beverly Hilton, you step on tan leaf-patterned carpeting and see texturized tan-yellow wallpaper and white crown molding lining the bedroom. On one table is a Bose Wave Music System radio/CD player that comes with a remote control, while above the chocolate-colored credenza is a 42-inch HDTV flat-screen silver LG TV. Sliding doors lead out to the terrace. There, a rattan mat, two white mesh chairs and a small round glass-topped table are available so you can look out over the hotel’s circular drive and out at the city. A large mirrored sliding door leads into the spacious bathroom, which is covered in tan marble tile with a black marble-top sink. Bathrooms in the in Wilshire Tower and Cabana rooms have 13-inch silver Sony flat-screen TVs built into the mirror. At Trader Vic’s Lounge, you can sit in a big brown semicircular booth inside the tiki bar, which doesn’t overdo it with the kitschy décor; or, for a more chic Polynesian vibe, take your meal and mai tais outside near the palm trees by the pool. Trader Vic’s serves Asian-tinged dinner and late-night bites. Our favorite things to order there include the lobster dumplings and Thai red curry. For tasty California cuisine in a sleek and modern setting, opt for Circa 55 restaurant, which serves breakfast — including a huge morning buffet that takes up two rooms — lunch and dinner. Other dining options inside the Four-Star hotel include the Lobby Bar, which offers light nibbles all day long, and Aqua Star pool, where you can get sandwiches and snacks in the afternoon and early evening.